My love affair with Candy. When I was a kid, Halloween was my most favorite holiday. I loved to spend hours deciding on my costume, and then I had the fun of helping my mother make it. Then the magic day arrived. I was so excited I couldn’t eat breakfast. At school we made Halloween pictures with black cats, pumpkins, and witches. We sang songs about the holiday. The excitement built until we exploded out the doors at the end of the day. We had to eat supper so I chocked it down and then put on my costume. We ran from house to house chanting “Trick or Treat”, holding out our pillowcases, watching the treasures be dropped into our bags. Then we’d dash off to the next house, and chant again. When my mother signaled time was up we would race home to sort the candy. We’d take turns dumping the pillowcase of candy on the kitchen table. Carefully we would sort it into piles – to keep, and to trade. After the ‘to trade’ pile was pack into the pillowcase, the fun would really begin. While the piles of Mini-chocolate bar, bags of chips, packages of gum, life-savers, red licorice, and the traditional hard-toffee candy wrapped up in orange and black paper grew larger until everything was sorted. Then I put the candy in order of favorite to least favorite and put my favorite into the bottom of the bowl and then work through the piles until the least favorite were at the top. Then my sisters would do exactly the same process until three bowls piled high with candy sat on the counter. Then the bartering started. I don’t like chocolate – peanut butter cups, so I’d put them on the table and my sisters and I would haggle until everyone was satisfied with their candy. Only after all of this was completed were we allowed to eat any of it. Then we got three pieces each a day until it was all gone which usually took us until Easter and then we’d get a new supply of candy. Every time I see the bags of candy in the stores it brings back great memories. Now you know why I love candy so much. 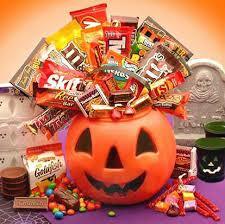 Which is your favorite Halloween Candy? Gainsborough, England – a small, market town that homes an old Tudor manor house called, rather unoriginally, The Old Hall. I am a father to a five-going-on-fifteen daughter called Autumn who keeps me on my toes. She’s going through a cheeky stage, which I find more amusing than I should do. I’ve always lived in Gainsborough and went to school here. I went to the High School – Queen Elizabeth’s and stayed on for sixth form, but I decided that university wasn’t something I fancied at the time. I’ve often wondered if I should have gone, but they say things happen for a reason and all that. Tangled Redemption Release and Contest! 1/2 cup semi-sweet chocolate chips plus some for decoration. Blend butter, shortening with brown sugar and granulated sugar until light and fluffy. Mix in vanilla and eggs until combined. In another bowl, whisk together flower blend, baking soda, salt and baking powder. Gradually stir dry ingredients into wet ingredients. Preheat oven to 350 degrees. Line cookie sheets with parchment paper. Drop dough by measured tbsp. onto prepared pans at least 1 inch apart. Insert a chocolate chip or two upside-down on top of each cookie. These will be the bodies of the spiders. Bake for 9 minutes. . Top of the cookies will be lightly browned but they may look slightly uncooked in the centers. 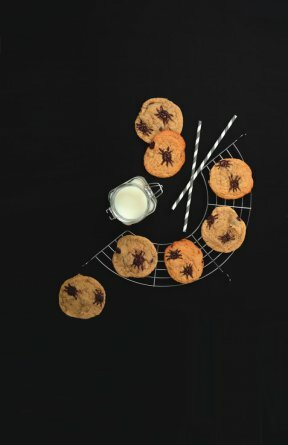 As soon as the cookies are removed, drag a toothpick out from the center of each melted chocolate chip to form 8 spider legs. Let cookies stand 5 minutes before removing to a cooling rack. 1 c very fine white rice flour. Whisk ingredients together in a large bowl until well combined. Store in air tight container. It’s that time of the year again. It’s not even Thanksgiving. We haven’t had Halloween and the store I work in set up for Christmas last night. Now I love Christmas, but really do stores have to choke it down our throats this early every year? The powers to be keep telling me that it will create more sales, it will get the customers in the buying mood but I know for a fact, it just ticks them off and they end up yelling at me. The bosses tell me they have done marketing research into it. Customers love them doing this. I don’t really believe this and I don’t care if it’s true. It’s just too early for stores to ram Christmas down consumers’ throat. What about the other fall holidays like Thanksgiving and Halloween? Don’t they deserve some respect too? If not respect then at least they deserve a little consideration. I think we, the consumers, should start a petition to keep Christmas out of retail environments till after Thanksgiving in the States. That gives us time to celebrate the other holidays.